This spring and summer has been a great adventure as we have worked to produce the best material and the best bags available for food storage. It has finally come to fruition as my wife and I (with her 16 weeks pregnant with twins!) unloaded a full truckload of new ShieldPro bags this weekend. It took about 4 hot, sweaty hours with my wife running the forklift and me manhandling pallets with a pallet jack. Our warehouse is now filled to the brim with beautiful, silvery, metally, Mylar-y goodness! Folks here know we have kept our focus mainly food storage related over the years (and intend to keep it that way, mostly!). We have dabbled in some different products here and there, but through everything our main focus has been Mylar bags and oxygen absorbers. Thus, we are very proud to announce a product that fits in one of those categories, but expands nicely in a direction we want to be moving. We’ve been receiving requests for this type of product for over a year now (over 100 customer comments in my little notebook at least), but finding manufacturing for something this specialized proved a little tricky. As we worked on the ShieldPro brand, we thought this would be a great addition to our focus of storage, though outside the food niche. I am very pleased to now offer the ShieldPro SafeCache storage bag. This bag is awesome. It is 11″x55″ long, made of the 7.5 Mil SafeCache material, the strongest metalized foil substrate I have found (and I’ve looked at hundreds of materials during this process!). It is incredibly durable, with amazing barrier properties to moisture and oxygen. The size will fit most long guns and AR’s (some optics may have to be removed for storage), as well as a ton of different types of equipment you may want to store out of your home. It can be cut and resealed so that a single bag can fit multiple handguns, cameras, phones, or various electronics. The challenge with trying to bury most standard gun cases is that water is a pretty amazing infiltrator, and it can and will seep through most everything. The SafeCache bag fixes all that. Used in conjunction with desiccant and standard storage procedures, you can bury whatever supplies you choose and know (barring earthquake or something crazy!) your valuables will be safe. 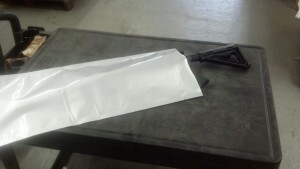 These bags are now available at Discount Mylar Bags. However, for our food storers, please don’t despair!=) We will have several new bags for y’all showing up at the store later this week. We will be replacing 2 items permanently with a brand new ShieldPro product. Our standard 5 gallon bag and 5 gallon zip bags, (both of which are still fabulous! ), will be upgraded to the new ShieldPro 5 mil substrate (material). Even better is that our pricing on both items will remain exactly the same ($1.27 for the 5 gallon and $1.79 for the 5 gallon zip). We will be running clearance pricing on the 4.5 mil bags these are replacing. ($.99 or less for the 5 gallon and $1.09 or less for the 5 gallon zip in bulk), and as mentioned in the last post, this is the lowest price offered on the ‘Net for these bags. Please note there is nothing wrong with the 4.5 mil products, and they have been a staple with us for 3 years now and we have sold millions of them! However, with our improved buying power, we have been able to work much closer with manufacturing to increase the quality of our products without increasing any costs to our customers, which is a great win for everyone! Please note that while it has been a very busy summer, we’re not done yet! We will be going back to manufacturing to figure out what other sizes and styles of bags folks might be needing. If you have any thoughts, please drop a comment or email! We don’t do any of this without input from our customers, as you are the most important thing in the world to us! You are currently browsing the archives for theFirearmscategory.